In Part One of our series on those six quarterbacks, we looked at Harry Agganis, the team’s first-round selection in 1952. Part Two featured Bobby Garrett, the first Stanford quarterback taken No. 1 overall in the draft. Part Three highlighted Mike Phipps, the All-American quarterback from Purdue taken in the first round in 1970. Today we look at the first No. 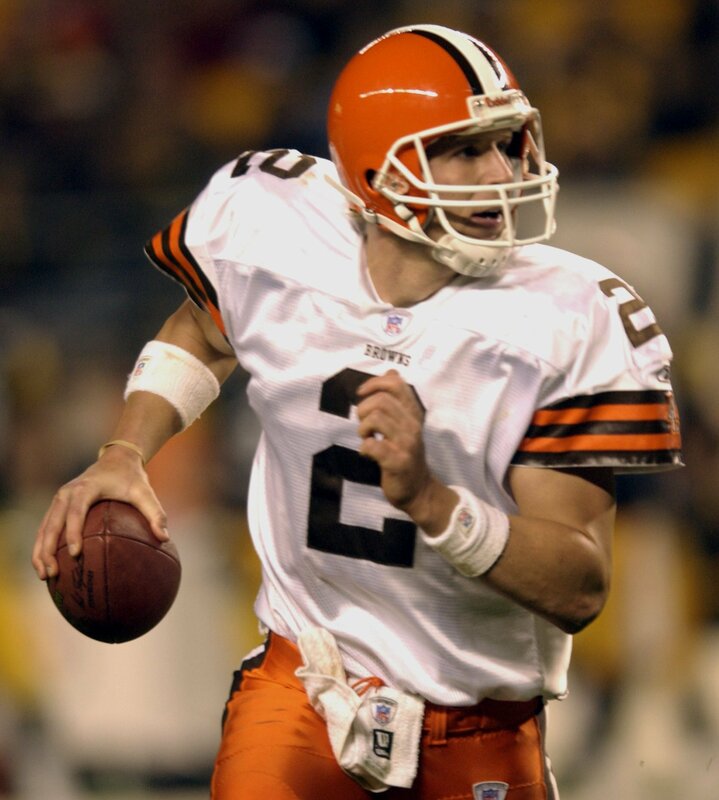 1 draft pick of the Browns when they returned to the NFL in 1999: Tim Couch. The NFL Draft in the spring of 1999 was a special time for the Cleveland Browns. After a three-year hiatus caused by the incompetence of former owner Art Modell, the Browns were back in Cleveland, albeit as an expansion team. While the NFL did the Browns and new owner Al Lerner no favors in re-establishing the Browns, the one area they did try and help out with was the draft, as the NFL awarded the Browns the No. 1 overall pick in what turned out to be a talented draft class. Among the players selected in the first round of the draft on that April Saturday in New York City were eventual Pro Bowlers Donovan McNabb, Edgerrin James, Torry Holt, Champ Bailey, Daunte Culpepper and Jevon Kearse. The New Orleans Saints were so desperate to move up to one of the top spots that they traded all six of their draft picks to Washington, moving up to No. 5 to select Texas running back Ricky Williams. But the Browns and general manager Dwight Clark did not want any part of that. Clark and head coach Chris Palmer had their hearts set on drafting a quarterback, a young talent that the team could build around as the Browns made their return to the NFL. Well, hard to argue with that logic, we suppose. Ultimately the choice came down to two players: Akili Smith, who only made 11 starts at Oregon, but wowed teams by throwing for 43 touchdowns against just 14 interceptions; and Tim Couch, who was leaving Kentucky as a junior after being named First Team All-SEC and First Team All-American. The Browns chose Couch, opting for the experience passer over a player, in Smith, who would play just 22 games in four years with Cincinnati and be out of the league by 2003. There was a lot to like about Couch, who was elected to the University of Kentucky’s Athletic Hall of Fame in 2007. In addition to being an All-American, he led the Wildcats to the Outback Bowl following his junior season (their first bowl bid in 13 years), was a Heisman Trophy finalist, led Kentucky past Alabama for the first time in 75 years, and is the school’s all-time leading passer. He threw for 8.772 yards, completed 67 percent of his passes and threw 76 touchdown passes. Bill Curry, the coach who recruited Couch to Kentucky, referred to Couch as “the most recruited athlete in history.” ESPN called Couch the sixth-greatest high school athlete of all time. The Browns were not the only ones to believe in Couch, either. A “cool” quarterback? A quarterback that made Kentucky, of all places, relevant on the football field in the SEC? Someone mentioned in the same sentence with Peyton Manning? What could possibly go wrong? This being the Browns, plenty. For starters, the Browns were an expansion team, so much like Mike Phipps in the early 1970s, the talent surrounding Couch on offense was less than ideal. For example, Terry Kirby led the team in rushing in 1999 with 452 yards (sadly, still better than what we saw from the Browns in 2013). Couch spent his five years in Cleveland handing the ball off to the likes of Travis Prentice, William Green and James Jackson, and throwing to such noted receivers as Leslie Shepherd, Darrin Chiaverini, David Patten, Quincy Morgan and Andre’ Davis. The offensive line was even worse, as Couch was sacked 56 times as a rookie and an average of 3.1 times per game through his first three seasons. We’re pretty safe in saying that we won’t see any of those players at halftime of a Browns game being inducted into the team’s Ring of Honor. Despite all that, Couch wasn’t a bad quarterback when he was healthy. He completed more than 60 percent of his passes twice in his career (just missing out two more times), and remains the last Cleveland quarterback to lead the team to the playoffs (which he missed with an injury, naturally) and beat the Steelers in Pittsburgh (a shocking 33-13 victory on a Sunday night in 2003). All those sacks and all those hits he took while running from opposing defenses finally caught up with Couch after the 2003 season – his final one in the NFL. The Browns wanted Couch to take pay cut and, when Couch declined, the team released their former No. 1 pick. Couch went to training camp with Green Bay in 2004, but the Packers cut him when it became clear his right arm was a mess. Surgery followed, as Couch had a torn labrum, torn rotator cuff and torn biceps all in need of repair. The repaired rotator cuff betrayed Couch again in 2006, necessitating another surgery. Couch tried one final comeback in 2008, with Jacksonville, ended up with him being cut and out of football at the age of 30. So did the Browns. So did the Browns. But just like his predecessors taken in the first round, things didn’t work out for Couch in Cleveland. And after going through six quarterbacks in the three years following Couch’s release, the Browns were ready to give it another try with a first-round quarterback. Tim Couch was an example of my rule: When you are expansion, you look to build the lines first. If there are no studs there, get a defensive playmaker #1 overall. They should have taken Champ Bailey (defensive playmaker) or traded out of that pick with NO and got the windfall Washington got.